Showrunner Steven Moffatt will also depart the BBC show at the end of the year and new reports claim the “Time Lord will bid a final goodbye to Clara Oswald as well as Bill Potts”. A source told the Mirror: “Jenna Coleman has agreed to film something new as Clara. “It’s become a tradition now for the companions to reappear as the Doctor regenerates and Jenna isn’t letting the side down. Jenna’s comeback is in line with the other companions returning to say goodbye as Billie Piper returned as Rose Tyler for David Tennant’s exit in 2009 and Karen Gillan also came back for Matt Smith’s farewell in 2013. (2) ARACHNOANTHEM. Here’s the first two stanzas of Camestros Felapton’s awesome review of Spider-Man: Homecoming done to the tune of that theme song. Was it good? Listen bub. It didn’t recap the story of how he got radioactive blood. At last: A Spider-Man movie! …says no one. The new Spider-Man: Homecoming, which celebrates Peter Parker’s immigration to the Marvel Cinematic Universe as a headliner after his scene-stealing appearance in Captain America: Civil War last year, is, according to the most recent data available, the sixth big-screen Spidey flick since 2002. Who needs another? Well, if they’re going to be as fizzy and funny and warmhearted as this, keep ’em coming. (4) SWEARING FOR SCHOLARS. Yesterday’s Scroll item about stfnal swearing prompted David Langford to note in comments that the Science Fiction Encyclopedia’s recently added its own article about “Swearing”. He’s got so much stuff – teeth and whiskers, claws and horns, tail and everything – that he’s much more satisfactory to swear by than any other space-god I know of. […] A man swears to keep from crying, a woman cries to keep from swearing. Both are sound psychology. Safety valves – means of blowing off excess pressure. (5) ARISIA’S SMOFCON SCHOLARSHIPS. The group that puts on Arisia also funds SMOFcon scholarships, $1000 to be divided among selected applicants. (They don’t just do a handy-dandy press release like the CanSMOF crew I publicized yesterday.) See Arisia’s application guidelines at the linked page. I found out about Robert Forward, a NASA scientist, when reading Stephen Gillett’s World-Building and so ordered it. Forward has some clunky character work and I wouldn’t say his female characters published in 1980 age well, but he outsciences Clement. I have four of Forward’s novels. Naren Shankar has a long-running career in science fiction television. He’s written for such critically acclaimed series as Star Trek: The Next Generation, SeaQuest DSV, Farscape, and The Outer Limits. Naren has also been a showrunner for CSI and currently serves as a showrunner for SyFy’s The Expanse. Coming from a science-educated background, Naren has been able to help push real science in television shows. I had the opportunity to chat with him and get his perspective on the evolution of genre TV, his career, and all things The Expanse. You have an amazing TV background. You’ve done so many different shows. Walk me through your origin story. …After graduating, I decided to stay on in graduate school. I was in Applied Physics and Electrical Engineering; I had stayed on in Cornell. And one of my friends decided he was going to move out to Los Angeles and become a screenwriter. We always loved movies, we always loved television shows and that was always sort of part of late night TV watching in the fraternity. And my other friend was Ron Moore. Ron was a political science major. About a year after our first friend went out to LA to try and become a screenwriter, he dragged Ron out there. Now, I had started college really early. I just turned 16 when I entered college. I was really young and was two years ahead of Ron, but we were the same age. I was several years into graduate school as I was working on my doctoral research. The way I describe it, I started feeling more and more like an expert on a smaller and smaller corner of the universe. And it felt kind of isolating. So what started happening is that I began taking courses in the arts, and history and literature again. Actually doing them, while I was doing my research. And what was happening was that I found that side of things extraordinarily fulfilling, and my lab rather lonely. It was literally that much thought. (8) JOAN LEE REMEMBRANCES. Entertainment Weekly’s Nick Romano, in “Revisit Stan and Joan Lee’s Sweet X-Men: Apocalypse Cameo”, has a still from the X-Men movie and a tweet from Bryan Singer about Joan Lee’s passing. Also, Marvel Entertainment has released a video clip of Stan Lee telling about meeting his future wife for the first time. On April 14, 2017 Joe Quesada, Marvel’s Chief Creative Officer, sat down with Stan Lee at the Paley Center in Beverly Hills, Calif. The video below was originally planned to be part of a series from the event scheduled for release later this year. In remembrance of Joan Lee and her importance to Marvel and the history of comics as a whole, we felt it appropriate to release this now. (9) ELLIS OBIT. Nelsan Ellis (1978-2017): American actor and playwright, died July 8, aged 39 (heart failure). Genre appearances in True Blood (81 episodes as ‘Lafayette Reynolds’, 2008-14), Gods Behaving Badly (2013). July 8, 2011 — NASA launched its last space shuttle, Cape Canaveral, Florida. (11) COMIC SECTION. John A Arkansawyer warns there may be Wonder Woman spoiler in this (quite funny) installment of Non-Adventures of Wonderella. (12) HANDMAID’S AUDIENCE. Damien Walter makes a provocative joke. Or is it true? I’m seeing two distinct groups of responses to The Handmaid’s Tale. Men – this show is dull, nothing is happening, going to stop watching. Women – this show is horrifying! Its my worst nightmare played out scene by scene! Going to stop watching. (13) FROM THE ANCIENT SEAS. BigThink’s 2016 article “Antikythera mechanism” includes a link to a YouTube video about a working reconstruction – made with Legos. (14) HELLS YES. Steve Davidson sees the Worldcon on the horizon and urges fans to ratify the Three-Stage Voting proposal (3SV) that received its first passage at 2016’s business meeting. One week from today, voting closes on the fabulous Hugo Awards. They’ll be handed out at Worldcon 75, being held in Helsinki, Finland, on August 12th, 2017. The ballot this year is remarkably puppy free; that doesn’t mean there aren’t any puppy noms on the final ballot, but there aren’t any puppy-dominated categories as there have been in years past. It’s taken four-five years now, but WSFS (that’s the World Science Fiction Society, of which anyone who has joined this year’s con, or next year’s con, is a member. That’s right, Worldcon attendees and supporters, you’re all members of a WORLD society, not just a science fiction convention), in its slow, sometimes frustrating yet inexorable manner, has responded to the assault on the awards effectively. In fact, there’s only one more step (well, two if you add in my suggestion that follows) required for forever ending puppy sadness: the ratification of 3SV. Step 1: Ratification of Three Stage Voting. While this will turn Hugo Awards voting into a three stage, as opposed to a two stage process, and doing so will add more work for administrators and shorten the time frames for each stage a bit, the advantages FAR outweigh this. 3SV, as it has come to be known, will allow all of the voters to take an advance look at what will be on the final ballot, and then vote again on whether or not they BELONG on the final ballot. Finalists that receive above a certain number of “not on my Hugo Awards Final Ballot” will be removed and replaced by the next most eligible nominee(s)…. Renowned literary agent DongWon Song gave a great talk at this weekend’s SLF writing workshop, about how to pitch your work. One of the things he talked about is the idea of starting a pitch with the “A + B = Awesome” format, to suggest two other well-known works that your work is similar to in some way. There was a lot more to the idea than that, but that part inspired me to put together a little pitchbot that provides suggestions for combining two works. A couple of writers who’ve seen this have said that it could also work as a writing-prompt generator. In the grand tradition of Archie vs. The Punisher and Archie vs. Predator (Obj Dave Barry: I’m not making these up), come fall we’ll be getting Harley Quinn and Poison Ivy Meet Betty and Veronica. Entertainment Weekly reports “Gotham and Riverdale to collide in Harley & Ivy Meet Betty & Veronica”. The series will be co-written by Marc Andreyko and Paul Dini, with art from Laura Braga. Dini originally created Harley Quinn on Batman: The Animated Series, the show that also established the character’s flirty friendship with Poison Ivy. The new series will find them pitting their girl power against Riverdale’s most famous pair. When a proposal emerges to drain the wetlands between Gotham and Riverdale, Ivy sticks up for her beloved fauna by enlisting Harley to kidnap valuable heiress Veronica Lodge and her best friend, Betty. Chaos, you may assume, ensues. (17) THERE GOES THE NEIGHBORHOOD. First world problems. (18) SHADOW CLARKE JURY MARCHES ON. In less than three weeks the winner of the Clarke Award will be known. The Shadow Clarke Jury is getting in its last licks – will the sf genre go down for the count? This statement will not be popular among the Wayfarer’s legions of loyal fans and advocates, but I’m going to make it anyway because I believe it to be true: there is no real science fiction in A Closed and Common Orbit. In a climate where novels of so-called literary SF are often castigated by SFF commentators for using the trappings of science fiction to grant legitimacy and authenticity where none has been earned, when it comes to empty gestures the Wayfarer novels – clasped rapturously by fandom to its collective bosom – trump them all. I would not want to waste valuable time arguing over whether A Closed and Common Orbit is in fact eligible for the Clarke Award – the book is marketed as science fiction, there are AIs, aliens, distant planets, job done. Whether it deserves its place on the current shortlist is another matter entirely. Organising and participating in this year’s shadow Clarke jury is turning out to be a pleasure on multiple levels, not least exchanging thoughts and opinions and discoveries with my fellow Sharkes. Speaking purely for myself though, the most significant effect of this experiment has been to make me question the very validity of ‘science fiction’ as a literary genre. In a literary landscape where everything is up for grabs, and where the tropes of science fiction – time travel, genetic and social engineering, apocalypse scenarios of every variety, artificial intelligence and mass surveillance – are increasingly becoming both core subject matter and metaphorical framing device for novelists of every nation and literary inheritance, can we usefully continue to argue for science fiction as a literature apart, worthy not just of separate study but of special pleading? There are, in broad terms, two types of fiction. For convenience, although I am not happy with either term, I shall call them mode and genre. A genre work might include crime fiction, ghost stories, love stories and so on; they are identified by the type of story they tell. A war story would not count as a war story if war itself was not central to the story, if it did not include the familiar markers of battle, soldiers or any of the expected paraphernalia and effects of war. Modes, on the other hand, might include contemporary mainstream literature, historical fiction and science fiction. These are identified less by the the story told than by setting, style, affect, and other less readily defined characteristics. There is no specific type of story that must be told if a work is to count as historical fiction, it may be a love story or a war story or a story of political intrigue, but it must be set in the past. I thought my feelings about this book were all sewn up. I actually began drafting this review with a hundred pages still to go, so secure did I feel in my opinion of After Atlas as the Clarke equivalent of His Bloody Project in last year’s Booker line-up: my hands-down favourite as a reading experience, though perhaps insufficiently innovative or controversial to justify its winning. And then came the ending, the unveiling of the central mystery, and I found myself thinking back to the autumn of 2015, when I went to see Guillermo del Toro’s lavishly over-produced haunted house movie Crimson Peak. I wasn’t expecting much from that movie, if anything, and so I spent the first hour and a half feeling excited at how wrong I’d been in my prejudgements. The film looked amazing, as predicted. Far more surprising was the conviction of the performances and – what’s this?? – a strongly scripted storyline I actually cared about. I began mentally drafting a blog post: how wrong I’d been about this film, how Del Toro had actually managed to square the circle and make a genuinely decent horror movie whilst operating within commercial constraints. Since the 2013 all-male Clarke shortlist, it’s been assumed that Clarke jurors have been striving for gender parity of authors when constructing their shortlists, but more recently, through the data analysis of Nicola Griffith, we’ve become aware of the even greater problem of protagonist gender disparity: Apparently, genre readers and critics prefer to award books about males, regardless of author gender. I’ve often noticed that this is particularly true of the of the investigative-type police procedural mystery narratives, a modality SF writers often like try on, and exactly true of the police procedural selections on both the Clarke and Sharke lists. While I wouldn’t be so hyperbolic as to say there is a deafening silence about female investigative protagonists, because there are a ton, but within SF, and especially within the SF book awards machine, the general perception of this mode is that it belongs in the masculine realm. The pragmatic, dogged, stiff upper lip investigator is a common, easy mold for authors to sink into, and although women protagonists could easily slip into that role, we readers, unfortunately, get more Mulders than Scullys. Two novels that don’t appear to have anything in common, but are written by two powerhouses of opposing camps of the British literary community: Clarke winner and regular fan favorite, Tricia Sullivan, and Baileys Prize winner and regular contributor to various media on all things sci-fi, Naomi Alderman. Within the cloisters of British science fiction, these are two famous SF writers with a persistent presence in the field, yet neither has managed to vault over the high, imposing barbed walls of American commercial success. It’s no secret that The Wayfarers series is written by someone whose writing is heavily influenced by the two-dimensional, wrap-it-all-up-before-the-credits, don’t-scare-off-the-advertisers format of television, so it’s no surprise to me that this book reads like a novelization of a TV/movie that has already been made. (No, I’m not talking about Firefly. This series is nothing like Firefly.) Fans and reviewers have been hooked by the low-risk palling around of characters, the exotic alien foods, and the explainy, back-and-forth dialogue that attempts to teach open-mindedness. It is Doctor Who without the danger and squirm; Farscape without the oppressive political foes, Friends without the humor and occasional cringe. Of all the six Clarke-listed novels, The Underground Railroad best does what I think a Clarke-winning novel should do. It has Handmaid’s Potential: it employs the tools of science fiction (anachronistic technology and alternate settings and timelines) to examine and illuminate the present reality, and will make more sense to people of the future than it does right now because we are too embedded in the system that it critiques. It’s the only novel on the list that I think will be remembered and still considered important in twenty years. Some might be surprised to see that I’ve ranked A Closed and Common Orbit above Occupy Me, but at least ACACO does what it sets out to do—which is very little—while Occupy Me just feels messy and careless, a frivolous taking on of experimentation and entertainment that achieves neither. Through much of A Ghost Story, Casey Affleck or a stand-in plays a dead soul, draped in a sheet with cut-out eye holes. This low-budget approach to the supernatural might suggest that writer-director David Lowery is playing a Halloween trick on movies that take the paranormal seriously. Except that he opens the tale with a line from “A Haunted House,” a story by Virginia Woolf, not Stephen King. (20) THE MARS MY DESTINATION. Meanwhile, the Mars project David Levine was on now has a cast of high schoolers: “To Prepare For Mars Settlement, Simulated Missions Explore Utah’s Desert”. Victoria LaBarre was climbing out of a canyon and into a bright, vast, seemingly lifeless landscape when she started to experience an astronaut’s nightmare. The symptoms were real — maybe from claustrophobia, or from exertion at high altitude. But LaBarre didn’t unlatch her helmet to get a breath of fresh air because, in this simulated Mars exercise in the Utah desert, she was supposed to be an astronaut. The canyon was standing in for Candor Chasma, a 5-mile-deep gash in the Red Planet’s surface. On Mars, there’s no oxygen in the air — you do not take off your helmet. So, instead, LaBarre radioed for help from fellow members of Crew 177. The team of students and teachers from a Texas community college had applied together to live and work for a week this spring in a two-story metal cylinder at the privately run Mars Desert Research Station near Hanksville, Utah. (21) BOOS AND BOOZE. 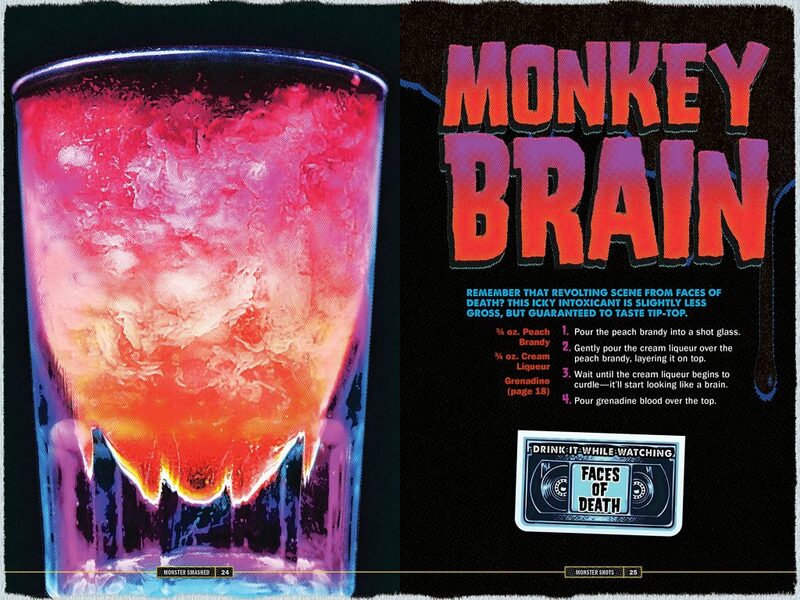 You’ll feel no fear (or much of anything else) after a few of these — Let’s Get Monster Smashed: Horror Movie Drinks for a Killer Time will be out in hardcover on August 28. 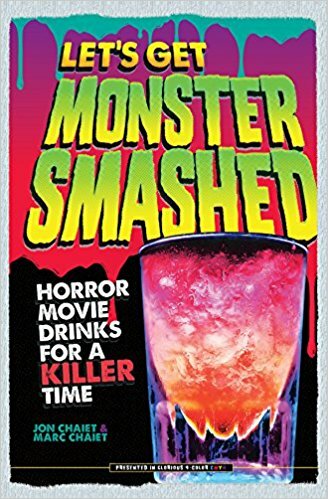 A horror movie inspired cocktail book with gross-looking but delicious party drinks, all wrapped up in an awesome ’80s VHS package. There are 55 recipes spread across 5 chapters (shots, gelatin, punches, special fx, and non-alcoholic) inspired by classic pulp horror movies of the ’80s and ’90s, complete with viewing recommendations. The movies may be weird, the drinks may look gross, but the elevated drink making techniques and unusually tasty recipes keep readers and their guests interested and coming back for more. Great for theme parties, Halloween festivals, movie fans, and retro enthusiasts. This entry was posted in Pixel Scroll and tagged 3SV, Archie, Arisia, Arthur C. Clarke Award, Black Gate, Camestros Felapton, Damien G. Walter, David Langford, David Levine, Derek Kunsken, Doctor Who, Jed Hartman, John A Arkansawyer, Joshua Sky, Mars, Marvel, Megan AM, Nina Allan, Paul Kincaid, Science Fiction Encyclopedia, Smofcon, Spider-Man, Stan Lee, Steve Davidson, The Expanse, Tom Galloway, WSFS by Mike Glyer. Bookmark the permalink. @Kendall: Thanks. someone stuck this song in my head this morning and I had to get it out of my system. re:shadow jury: I do like their reviews in general, even if I often disagree with them. But this review has the problem, that she never sais why ACACO is no SF in her opinion. So to discuss I would have to resort to guessing her reasons and I stopped doing guessing games in these cases and just resort to ignore reviews, that fail to explain the points they bring up. If she cant be bothered to explain that statement, I cant be bothered to exert any mental power to interpreting it. @Heather Rose Jones: IMHO it’s unreasonable to ask that authors get special immunity to commentary and criticism based on past writings & actions just because #1 they’re authors publishing SF (or anything else, though in this case it’s relevant to me that she publishes SF, specifically) or #2 their writing included fiction or actions related to their fiction. Sorry if that sounds harsh, but I feel like you’re asking for special treatment for authors (intentionally or not). BTW I don’t see the comments here as descending into “OMG SHE DISSED BOOK I LURV…MUST MAKE RANDOM ATTAX!” (which I know happens, and I understand how the fear of it concerns some authors). and then she says a book with aliens, AI, robots, clones, wormholes, spaceships isn’t SF? The hell? Sidra’s liable to be executed at any time, her buddy went through unspeakable hell on a junk planet as a kid, and it’s “too nice”. Bah. I throw her own arguments right back at her. ACaCO is way way more SF than her story, which is literary fiction (or possibly even women’s fiction) with a thin veneer of slightly futurey stuff. It’d be the same story if it was set in 2017, substituting some other expedition for Mars. It’s a good story, But Is It SF? I’ve been wondering that all along. I’d like to see her apply the same criteria to her own work. Quality of writing isn’t everything in a genre award, though it’s important. There’s not a whole lot of bad people doing grimdark things in her story, either — mostly just pleasant folks with some quirks working to get through the day. I do have Allan’s story high on my ballot. I was conflicted, because it’s not very SFnal, but it’s well done. When I was first writing reviews for Rocket Stack Rank, I would mark a story as “Not SFF” if the speculative element was “too small.” Like a story where people could get special tattoos that would display 3D images, but there was nothing in the story that would have changed if the tattoos had been the regular kind. I gave that up pretty fast. Way too many stories have a “disposable” speculative element. We went online in September 2015, and by November, I’d decided I’d go ahead and review stories as SFF no matter how slight and unimportant the speculative element was–just as long as it existed at all–and I went back and gave ratings to a bunch of stories I’d passed over–including the tattoo one. Back home from my latest travels, and so I may have missed folk talking about the rather intriguing 17776 on the SBnation sports site. It’s ostensibly about “football” in a far future where intelligent satellites watch a post-mortal Earth. Over a few episodes it’s turned into a rather fascinating study of immortality and invulnerability, all done in multimedia with video, animated maps and web animations. 2 & 3) Spiderman Homecoming was great. I really liked how parts of it used the effects of prior events to make new characters, and how parts of the MCU were woven into background things in the movie. Would’ve been nice to have seen some kind of acknowledgement of the Netflix part of the MCU considering the location. Just a great all around adaptation pulling from various influences and changes made to some of the characters felt authentic to the setting while retaining their memorable attributes. Also I like how MCU appears self aware and jokes about things like the teasers at the end and also some complaints like how in a singular hero movie they don’t ever ask for help from the other heroes they know which can’t be leveled at this movie. And did Jon Favreau not age since Iron Man? Happy looked like the same man from the first Iron Man. 8) ‘She is my universe’ Oh man, that hit me. I hope he’s doing okay. 12) He sounds very concerned. 21) Book sounds up my alley, I have some skull shot glasses (the only type of crystal skull worth coveting) and my wife went out and bought a brain ice cube tray the next day. Might be able to make some fun drinks. The ‘Is X really [insert genre]’ makes me wonder if beating a dead pixel with a scroll has been taken as a title before? Mike linked to it several Pixel Scrolls ago. It’s item #7 and it’s terrific. @15: there used to be a ~comedy trope “A is an X, B is a Y [X and Y radically different]; together, they fight crime!” Adding a place adds a very small amount of amusement. @18: I disagree with several of the points in the Sharke items I read (I didn’t try to read all of them) but found others (e.g., Nina Allan on A Closed and Common Orbit) to be clean statements of my usually inchoate opinions. Definitely worth reading. I don’t object to Chambers’s works because they’re about decent people doing decent things decently; I do object to the smugness about this that radiates from the books, a sort of “You’d be a lot better off if you just did it my way without question!” bolstered by ridiculous coincidences and/or facts materialized just when the author needs them to fix a plot problem (such as running out of). Mr. Rogers is all very well as pablum; sometimes adults like work a little less saccharine. Yes, that’s probably a bit of an overstatement — but I think the commenters slamming the Sharkes have also overstated. And +1 to @SamJ (re Chambers hammering opinions). Kendall: That said, I bear no ill will towards Allan; I just think she was foolish and in one case, hypocritical. I liked her story a lot, BTW, and that opinion (and my interest in her future work) hasn’t changed a bit. I quite liked TAoST — for a lot of the same reasons I liked ACaCO, that they explore themes of identity, and finding one’s place in the universe and making peace with it. But yes, I’d have to say that Allan’s story is far less SFFnal than Chambers’, which is why I found her criticism bizarre. I will be the first to admit that I am willing to give stories which are light on SFFnal elements a pass if I find that they have other major virtues. Neither Genevieve Valentine’s Persona nor Ben H. Winters’ Underground Airlines, both of which were scant on SFFNal elements, really satisfied me in the way that ACaCO and TAoST did. The other thing I noticed is that in her “Does Science Fiction Still Exist?” essay, Allan praised the 2005 Clarke finalists David Mitchell’s Cloud Atlas and Audrey Niffenegger’s The Time Traveler’s Wife as “the moment where science fiction as a meaningfully separated mode of literature ceased to exist”. Considering how unsatisfying and poorly-constructed I found both of those books in terms of science fiction, I don’t think that she has proven her claim. I found the first installment, with the sentient satellites, fantastic, and the use of various media in the storytelling really creative. But I thought that the subsequent installments, with the football collecting, and games on state-sized football fields, got old really fast. Both ACaCO and TAoST are sf. They have sf elements, that’s good enough for me. I do think it’s reasonable to choose to use relative sfnal content as part of voting decisions, especially as a tie-breaker – sf/f has always been partly about interesting concepts and ideas and really good ones should get the credit for it. Re: Nina Allan, I had another look at her essay linked just under the ACaCO review and I think it suggests that ‘not really science fiction’ isn’t something she has an especial problem with. I suspect that what she means by the review itself is that it doesn’t do anything new and exciting with technology and so on, which is probably fair as a criticism if not as a useful qualifier for science fiction, although I could be entirely wrong about her intent. However, occasional anvils aside, ACaCO (and the Wayfarers series in general) does try to say things about alien interaction and also what it would really be like to be a programmed intellect dumped into the wrong body, and at least as far as I’m concerned that’s doing plenty interesting enough things with sfnal ideas to qualify under that criteria. Like, it didn’t knock my socks off but it tried. But I’m really soft on the ‘is it sf?’ question, so there’s that. I enjoyed Allan’s fiction story. I do not like her nonfiction writing. My dad always said that there are two kinds of nonfiction writers: those that want to teach others, and those that want to impress others. She strikes me as the latter. I don’t think that she’s wrong with all her criticisms of ACaCO. Chambers is writing in a universe reminiscent of Star Trek. It wasn’t a deal breaker for me. But there was nothing Waltons-like that I saw. As for her other essay, it pushed all my buttons about literary vs. sf tropes. @Greg Hullender: Not that you asked, but IMHO that was a good decision (your reviewing change regarding “too small” speculative elements). @Meredith: Re. tie-breakers, that reminds me, I liked the first-four-on-my-ballot Novellettes this year a lot (including Allan’s); ranking them was tough! I ding’d Allan for being barely SF (though I’ve seen less SFal stories on the ballot! ), but the only easy part for me in this category was (a) putting another story 5th, (b) putting No Award 6th, and (c) leaving Stix off the ballot entirely. I put Allan’s story fourth, but I suspect with a little more SFalness – and/or maybe if one thing hadn’t been so obvious – it might’ve been at least second for me. She had tough competition this year (for me, anyway), but wrote a very good story. I like being spoiled for choice in a category. 🙂 I felt like this about Novella, too – 4 great stories out of 6; tough call. Mike: Did someone else beat me to this Pixel Scroll title (I suggested it a few days back http://file770.com/?p=36130&cpage=2#comment-667657 but someone else could easily have thought of it before me)? and now I see the credit, which probably means that I somehow missed seeing it the other day. Sorry about that. In the Country of the Pixelated, the First-Fifth Man is God(stalk). Thanks. I’m always happy to hear feedback about Rocket Stack Rank. So I got through the first chapter, which seemed vaguely interesting, but then the second chapter seemed utterly impenetrable for me. Do I need to just keep pushing through? Does it get more interesting or is it all about weather patterns and a very long boring NFL-like game? Laura “Tegan” Gjovaag: So I got through the first chapter, which seemed vaguely interesting, but then the second chapter seemed utterly impenetrable for me. Do I need to just keep pushing through? Does it get more interesting or is it all about weather patterns and a very long boring NFL-like game? I stuck with it I think partway through the 4th installment after which I abandoned it. I thought that the first installment was brilliant, but that it went downhill and got really old and uninteresting after that.